Blog › Information › Remembrance Day 2017 – Have you bought your poppy yet? Remembrance Day, also known as Armistice Day, is on 11th November. On this day in 1918, the Great War, World War I, ended. The war ended at 11am on the 11th day of the 11th month. Every year on this day at 11am, there is a two minutes’ silence for us to remember all the people who were killed in the First World War and in all the wars since then. In the UK, most people will stop what they are doing and stand in silence for two minutes. Remembrance Sunday takes place on the second Sunday of November. This year it will be on Sunday 12th November, 2017. On this day, a service is held at The Cenotaph in Whitehall, London, with the Royal family, religious leaders, politicians and representatives of the Armed Forces. The Queen places a wreath on The Cenotaph and there are other tributes to remember everyone who has died in wars for their country. On this day, there is also a two-minute silence at 11am. The red poppy has become a powerful symbol of remembrance to commemorate the First World War. This is because poppies flourished in soil churned up by fighting on the battlefields of the Western Front during the war. Canadian doctor John McCrae penned the poem 'In Flanders Fields', which said “poppies blow between the crosses, row on row”. Poppies are red flowers which usually only grow on land which has been disturbed. Poppy seeds can lie in the ground for years but will only blossom when the land is torn apart. During World War I, there were many battles in Northern France and Flanders and most of the buildings, roads and even trees disappeared. 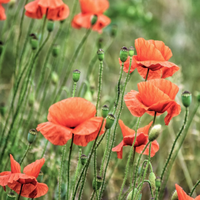 However, every year when the weather started to get warm, poppies grew in the fields where battles were taking place and they brought colour and hope to the soldiers who were still fighting. Poppies have become a symbol of our remembrance of those who lost their lives in wars and people wear them to show that they are remembering. A charity called the ‘Poppy Appeal’ was set up by the Royal British Legion to raise money for people whose lives have been affected by war. So please wear a red poppy today in honour of the fallen on Remembrance Day. You will be respecting those who sacrificed their lives to protect our way of life and democracy. Please buy your poppies from the Royal British Legion, but pay homage to the fallen by purchasing a poppy at Brilliant Wall Art. Our poppy metal wall art range will remind family and friends of these important pivotal moments in British history. I particularly like the…‘Red Poppy Flower Bunch Metal Wall Art’. It is a wonderful flower finished in red and dark colour tones, with jewel detail. It is easy to hang using the rear mounting bracket and measures approximately 63cm (25") high by 28cm (11") wide. A reasonably priced alternative is the Small red poppy garden stake. It has freestanding flower stake which adds a splash of colour to the garden all year round. Constructed from metal with a paint and protective lacquer it will resist the effects of the weather. It is a wonderful design for any home or garden suitable for inside and out. Each poppy is individually boxed with a collapsible stake which clips together. 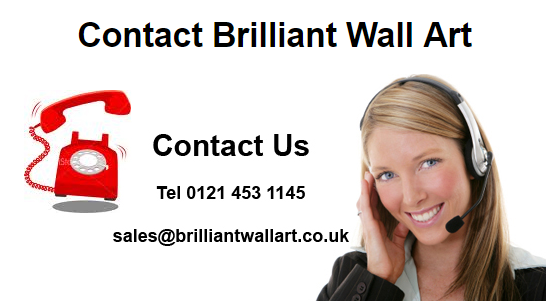 Brilliant Wall Art provides the best value metal, glass and canvas wall art across the UK, with numerous contemporary metal wall art designs for both the home and office. We specialise in large metal wall art and metal flower wall art, in particular. Why not take advantage of our multi-buy promotion? You could save up to £30 on your wall art. Simply spend a few minutes browsing our webpages, we offer a myriad of products and ideas.